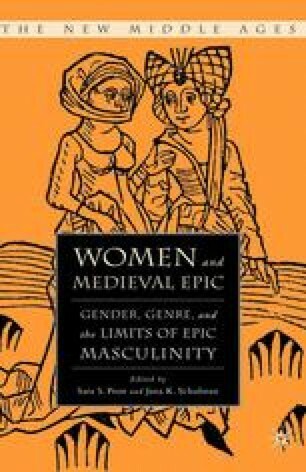 Most medieval heroines walk a one-way street to death as the prerequisite to their exemplary status. It is their sacrifice and self-abnegation that makes them models for behavior and heroines of fiction. Much the same could also be said for many male heroes, whose accomplishments, even on the battlefield, often veer into the hagiographie. In the case of the men, however, their deaths usually follow upon an earlier period in which they were able to force their will on others, proselytize, or fight, rather than just submit, however obstinately, to a superior force. Obviously there are generic distinctions at work here: romance and chansons de geste knights usually get to do a little damage before they die, and even vernacular saints ’ lives often depict their male protagonists as, at the very least, a nuisance to those in power and/or politically dangerous. Women, on the other hand, get fewer chances at heroism in the former genres, though one could certainly argue that Guinevere or Nicolette or Enide are heroes of another sort;1 and in hagiography, however much their exploits are highlighted as courageous and self-sacrificing, they earn their exemplary status primarily through withholding and safeguarding, refusal and resistance.2 With these distinctions in mind, a genre-bending text like the twelfth-century Occitan epic, Girart de Roussillon, a little known but powerful chanson de geste, lets us muddy the waters a bit. Here is a text in which women play a very small part, in terms of lines of verse spoken, but whose acts essentially determine the d énouement and the terms by which the tale and its characters will be judged. Their heroic status is, however, balanced by an equally insistent pull toward the saintly, such that their heroism is often seen exclusively in hagiographie, and therefore reductive, terms.